Bentley is paying tribute to the founder of the company and its 100th anniversary with a new special edition. The W.O. Edition by Mulliner takes design cues from 1930, and puts a part of the founder’s own car into each one. Bentley Cars was founded in 1919 by Walter Owen (W.O.) Bentley, with the goal of building “a fast car, a good car, the best in its class.” That objective has driven the brand ever since. The last car to wear the badge that was personally designed by W.O. was the 8 Litre. That car launched in 1930, and was the largest and most luxurious car the company had built to date. It used an 8.0L straight six and was capable of reaching 160 km/h. Bentley’s own Bentley was the second car off the line. It used the short wheelbase chassis and wore a body built by H.J. Mulliner, the coachbuilder that is now in-house and handles extra special Bentley customization. Bentley was forced to sell his car the following year, but it was bought back by the company that bears his name in 2006. The Mulsanne W.O. Edition by Mulliner is inspired by that 1930s 8 Litre. On the outside, the car wears onyx paint with a chrome bonnet strip and black alloy wheels. Although this is a Bentley, so customers can still change that paint, should they so choose. There is also special badging on the wheel centres, door sills, and fender. Inside is where it really becomes special. The Mulsanne wears a split colour interior with Fireglow Heritage and Fireglow hides, in a similar colour to the original intended to look like vintage hides. Beluga hide detailing, and blind stitching complement the look. The dark stain burr walnut veneers cover the gauge panel, steering wheel rim, and other cockpit areas. 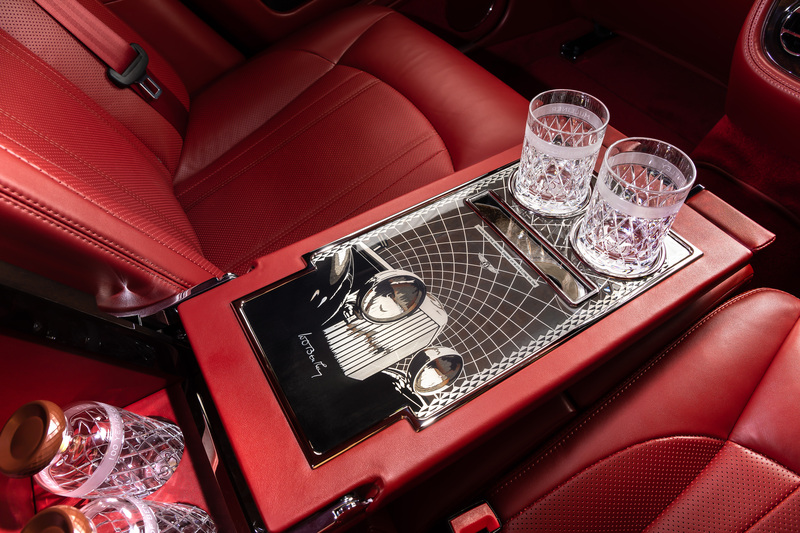 The special edition comes with lambswool rugs, glass tumblers, privacy curtains and a rear entertainment system. What really sets this edition apart is the cocktail cabinet. And not just for the fact that it has one. The cabinet in the special edition has an inlaid scene that uses four different wood types to produce the effect Bentley desired, along with aluminum. It depicts the front matrix grille and headlights of W.O.’s own 8 Litre. In a display window of the cabinet sits a piece of the crankshaft from that 1930 car, with an inscription detailing the importance of it. The 1930 model was restored after re-purchase in 2006 and the crankshaft was replaced as part of that restoration. Bentley has started its 100-year anniversary celebrations this month, counting down to the company centenary in July 2019. To mark that event, 100 of the Bentley Mulsanne W.O. Edition by Mulliner will be built. There are currently no comments on Bentley’s new Mulsanne pays tribute to Founder. Perhaps you would like to add one of your own?